One of the biggest problems last year was not having enough time. I was working full time and promoting the book (plus being in a serious relationship and getting a puppy) and I just had no time to write. This year will be different. While I will do an occasional promotional event (and definitely hit the Midwest and New York) I am going to be working on a new book. Still working out the details (and the contract) but I am super excited to be spending time writing instead of self-promoting. I did 32 events last year. 32! And I am not including interviews or radio in that count either. While I didn’t get rich on the book,* I hadn’t expected to. It was successful beyond, well, maybe not my wildest dreams,** but certainly my pretty enthusiastic ones. Because I deleted my events after they happened, I am going to list them all here so I don’t forget them as years go by. Feel free to skip these, but thanks to everyone who helped me get the word out about my book. 1. 2/20 Sonoma Valley Cheese Conference, Sonoma, CA My book came out early so I managed to premiere the book at my buddy Sheana’s yearly conference. I can’t think of a more appropriate place! 2. 2/20 Cheese Plus, SF Technically this was still a part of the Sonoma Valley Cheese Conference but it was at Ray’s store in San Francisco. Let the standing-around-behind-my-book humbling begin. Ari from Zingerman’s and I actually switched places and tried to sell each other’s books for awhile. 3. 2/25 Books Inc., Berkeley Calvin, the Berkeley Store manager, was incredibly supportive of my book. In fact, he had booked an event for it when it was supposed to come out on a different press in 2009 so I figured I owed him the first bookstore gig since he had to track me down to find out the book wasn’t coming out back then (my old press wasn’t returning phone calls). The Berkeley Books Inc. is really becoming a food book destination in the East Bay. 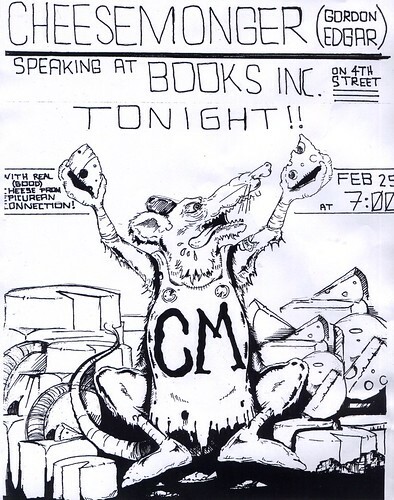 Plus, they made a home-made punk poster for my reading! 4. 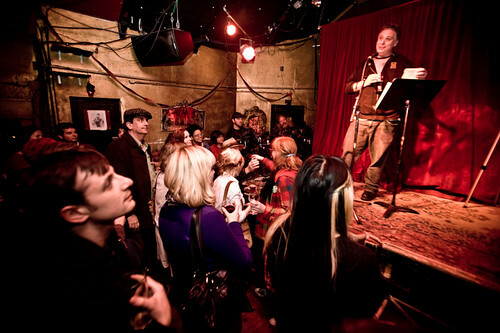 3/13 Modern Times/Amnesia, SF My first SF reading was sponsored by a co-op at the bar where I did most of my drinking in the early ‘90s. I saw some great bands there (The Fastbacks, Bratmobile, Tribe 8, Harris Flush etc.) here and I could barely believe I was on the same stage. This was an amazing experience. 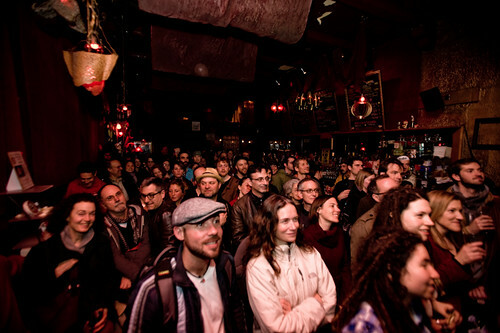 Look at the packed crowd! 5. 3/14 Book Passage, Corte Madera A hometown bookstore in the mall that used to have the Food Co-op back in the ‘70s. My parents invited all the parents of people I went to high school with so it was an odd, yet awesome, crowd. We even had two Seana/Sheanas serving cheese! 6. 3/20 Oregon Cheese Fest, Central Point, OR I thought this would be more stand-behind-copies-of-my-book-and-be-humiliated-while-no-one-cares but I underestimated the drunkenness of the participants and the sales pitch of the lovely Laurie Jones Neighbors. This event stood out for the two drunkies who insisted they knew how publishing worked and that I must have had the book ghostwritten. 7. 3/21 Reading Frenzy, Portland, OR I knew I loved Chloe and her fabulous store. I didn’t realize how awesome the Ace Hotel would be. I accidently read the paragraph about growing up Californian that I was going to omit when reading to Oregonians, oh well. Luckily, many of them were transplants. I totally cut myself while preparing cheese but managed not to bleed on the cheese or books. 8. 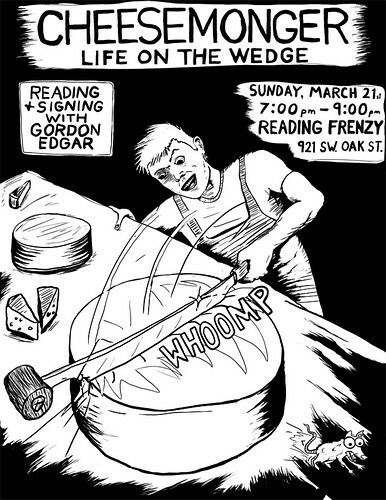 3/28 California Artisan Cheese Festival, Petaluma, CA Oh, the humbling of the behind-the-table book signing returns. *I only put that in here for the non-writers. Anyone who’s published a book already knows I didn’t get rich from it. **Wildest dreams redacted to keep this a family friendly post.